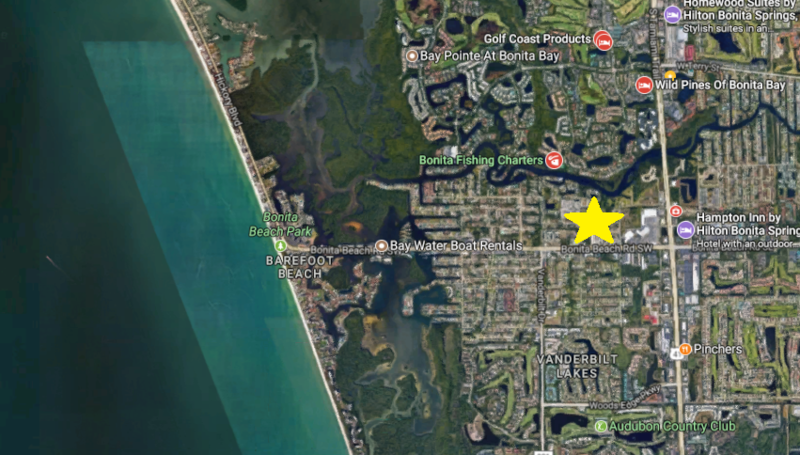 The neighborhood of Bonita Pines is located in Bonita Springs, Florida west of Tamiami Trail and north of Bonita Beach Road. The area is popular due to the close proximity to the beaches. Bonita Pines consists of about sixty properties built along the streets of Pine Tree Dr., Quails Walk and Windsor Rd. Homes vary in age and design as they were built over a span of decades. Some properties may have TFC-2 or duplex zoning. Periodically, vacant land parcels become available for sale. There are no common amenities for Bonita Pines and there is no homeowner association. Homes similar is style, location and values can also be located nearby at Ohlman Acres, Windsor Estates and Lake Pointe. Nearby conveniences to Bonita Pines include waterfront dining at Doc’s Beach House and The Fish House. Shopping and dining at 5th Avenue in Naples is about twenty minutes away and Coconut Pointe Mall is about 10-15 minutes away.